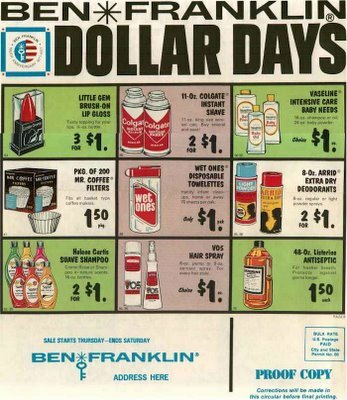 They still have Dollar days, but now its usually buy a chicklette for a dollar or a single square of toilet paper. Ah yes. I remember going to Ben Franklin ALL the time with my mother at my hometown's first shopping center. (Southtown Shopping Center). They were an original tenant there when it opened in 1965. Lasted until about late 1988 before they went out. The mall is still there, but BF is not. Now its space is a Pet Supplies Plus. Family Dollar is, in a way, the modern-day variant of a Ben Franklin now.....and they have a location within the same strip. Doesn't bring the same feeling though. I know I grew up going to BF all the time, too, with my mom and little brothers in Warren, Michigan in the early-mid '70s. Some great, great wide-eyed childhood memories I still have of those lazy afternoon excursions, man. There's still an old skool Ben Franklin in Smithfield, VA that mostly focuses on crafts now. All the "drug store things" are gone from the store though. It kind of reminds me of Woolworth in a way. Some of the packaging looks truly frightening. Before enlarging the picture, I actually mistook the deodorizer spray for insect killer. And whoever thought that "Wet ones" would be a good name for a toiletry product? That's some cheap stuff. I was born in March, 1977. Interesting find.